EXPERIENCING hardship is often the best way to learn the big lessons of life. Heartbreak, financial difficulty, hunger and hard manual labour are often times great motivators and they build resilience in those individuals that are not crushed by them. But, like banging your head against a brick wall, it is good when it stops! Taking a person who has experienced hardship and giving them an opportunity or access to resources will often result in great success. There are many examples where tenacity and grit have underpinned the success of social reformers, sportspersons, businesspeople and performers, and even every-day people in their every-day lives. Researchers Gulshan Mahajan, Amar Matloob, Barbara George-Jaeggli, Michael Walsh and Bhagirath Chauhan have studied this same phenomenon in an emerging weed in the northern grains region – African turnipweed. 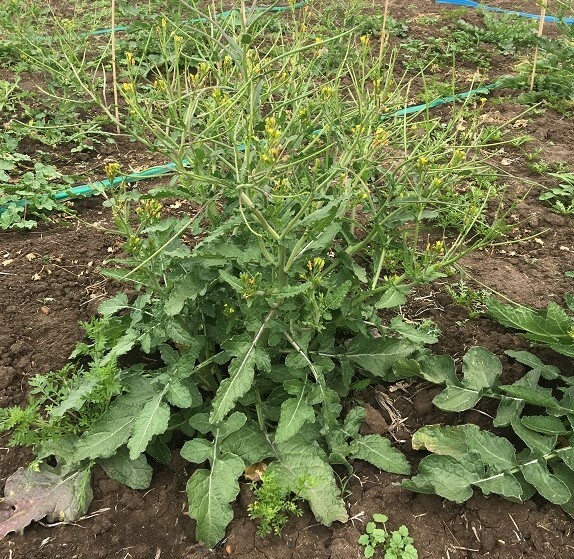 Working with two biotypes of African turnip weed – one from the higher rainfall environment of Dalby, Queensland and one from the medium rainfall environment of St George, Queensland – the researchers wanted to know if there were differences in the way that these two populations respond to environmental stress. They also wanted to gather intelligence about the germination biology of this weed, which is emerging as a potential threat to cropping in the northern region. When grown without competition, African turnip weed plants have high biomass and produce more than 67,000 seeds/plant. African turnip weed (Sisymbrium thellungii) is currently more common in southern Queensland, but is also present in northern NSW, mainly on black soil country. Until recently it has been a fairly innocuous weed that had not really been of concern to farmers. 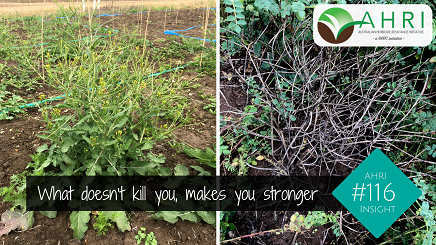 But, it is becoming increasingly difficult to control in winter crops and there is one confirmed case in southern Queensland of resistance to Group B (acetolactate synthase (ALS) inhibiting) herbicides. Having flown under the radar for so long, researchers have now set their sights on gaining a better understanding of the biology of this weed species. Weed ecology studies are an essential first step in developing a management strategy – you can’t manage what you don’t understand. 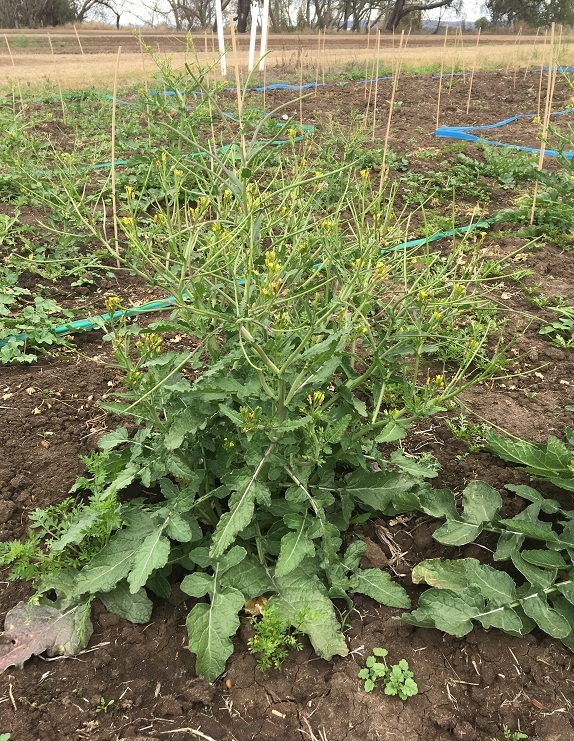 A study of the effect of water stress on plant biomass and seed production of African turnip weed in a pot trial using seed from two distinct biotypes (Dalby and St George). A study of the effect of temperature, light, salt, osmotic stress, pH, crop residue, burial depth and agricultural environment (fence line vs. cropped area near St George) on germination behaviour of African turnip weed under controlled laboratory conditions. When grown under a range of soil moisture conditions (25, 50, 75 and 100% soil water holding capacity) the St George biotype (medium rainfall) plants were much larger (89% more biomass) and produced vastly (321%) more seed than the Dalby (high rainfall) biotype. When the plants were grown under water stress (25% WHC) the Dalby biotype produced only 28 seeds/plant while the St George biotype powered through to produce 4061 seeds/plant. When the water stress was removed, the Dalby biotype produced 4787 seeds/plant compared to 9834 seeds/plant for the St George biotype. And this is the nub of the problem. If widespread resistance to herbicide were to evolve in the St George biotype, there is immense potential for a weed seedbank explosion. This potential is great in the current geographic region of the St George biotype, but even greater in the Dalby area if there were to be an incursion of the St George biotype (via grain, hay, livestock or machinery movement) into this more favourable environment. When it comes to germination ecology, African turnip weed is clearly a tough character (see Table 1). 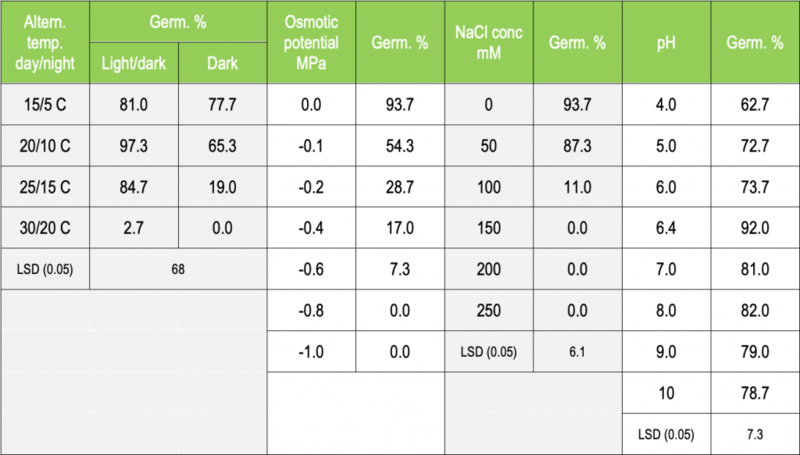 It is not the least bothered by soil pH (achieving over 60% germination at pH 4–10) and can handle highly saline conditions (as high as 100 mM NaCl). To preserve the seedbank, it holds out for sufficient soil moisture before initiating germination and does not germinate in day/night temperatures of 30/20 C and over. All these traits combine to give this weed a competitive edge, particularly in marginal soils or seasons. It is well suited to a no-till farming system with large quantities of seed being deposited on the soil surface. In a no-till farming system, strong germination rates (over 80 per cent) were observed in temperature regimes (day/night temperatures) ranging from 15/5 C to 25/15 C.
Although African turnip weed seed will germinate in the dark (albeit at a lower rate), it will not emerge from depths as little as 1 centimetre. The addition of 4 tonnes/hectare or more of residue reduced seedling emergence by about 30pc compared to the 80pc emergence in the no-residue treatment. Lower levels of crop residue may have the opposite effect, conserving some moisture while not providing sufficient shading effect, resulting in improved germination. In an associated seed bank persistence study, almost all of the African turnip weed seed placed on the soil surface decayed (or germinated) within 12 months. When buried at a depth of 2 cm and 10 cm, about 30% of the seed remained viable after 24 months. Getting to know more about a weed species’ biology is critical to formulating a control strategy and avoiding herbicide resistance. In cereals, there are some herbicide options, other than Group B, available to control African turnip weed, but in pulses and oilseed crops, the chemical options are very limited. The good news is that African turnip weed is susceptible to crop competition – particularly in cereals. When grown without competition, African turnip weed plants have high biomass and produce more than 67,000 seeds/plant. In 18 cm row spacing wheat crops, where the canopy starts closing after 4–5 weeks, African turnip weed plants remained very small and did not grow through the crop. 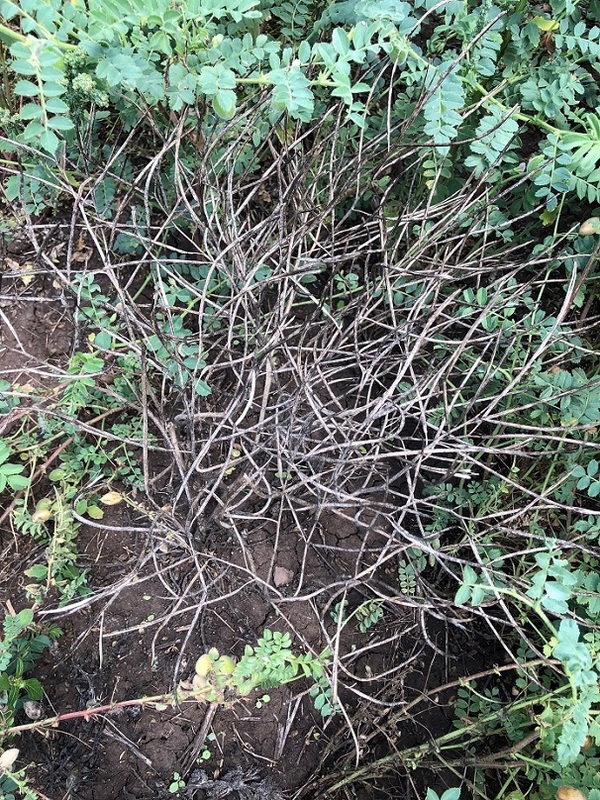 Chickpea, being a less competitive crop, allowed African turnip weed to establish and set seed. The weed seed was shed before the crop was ready to harvest, making harvest weed seed control ineffective for this species. In a competitive wheat crop environment, African turnip weed struggles to grow. African turnip weed can establish in chickpea crops and will shed its seed before the crop is ready to harvest so it will not be controlled at crop desiccation or with harvest weed seed control strategies. Preventing weed seed set in African turnip weed is a sure-fire way to bring this weed under control within a few years. The rapid decay of seed left on the surface can be exploited to help manage the seedbank and keep weed numbers low provided seed set is prevented in those plants that germinate. Strong crop competition is a good way to achieve this. Other cultural control possibilities include occasional light tillage (to a depth of just a few centimetres) of weedy patches and, in high residue situations, stubble cover of 4 t/ha or more can provide sufficient shading of the soil surface to prevent germination in a no-till farming system. Bear in mind that if cultivation is used to re-set the seedbank in a heavily infested patch, although the seed will not germinate from depth, the buried seed will remain viable for longer and so must remain undisturbed for many years. Even the planting operation could bring some seed back to the surface where germination would be possible. This research also clearly demonstrates the need to observe and respond to regional differences in weed behaviour and to take farm biosecurity seriously – clean seed, clean paddocks, clean borders.